The onset of fall has been all about pumpkin, spices, maple and pecans for me so far. So I figured, why not keep that theme going and combine those ingredients in a breakfast. I seem to be a bit light on breakfasts here on The Kitch and I'm not exactly sure why that is. Breakfast is totally Pure Veg friendly and doesn't have to consist of typically thought-of choices like tofu scramble. French Toast, Waffles, Pancakes... All are simple to Sneaky-Veganize. These sweet, spiced pumpkin pancakes are definitely seasonal, but there's no rule that says you can't enjoy them any time of the year. Start the cinnamon syrup: Heat syrup and cinnamon sticks over low heat for 10 minutes. Remove and let steep for 20 minutes to 1 hour. Remove sticks and pour into a small pitcher. 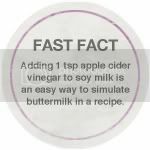 Prepare the pancake batter: Combine soy milk and vinegar in a small bowl and allow to sit for a few minutes until it curdles. Stir together pumpkin, water, soy milk mixture and vanilla extract in a large mixing bowl. In another medium to large sized mixing bowl, combine flour, baking powder, baking soda, spices and salt. Add the dry ingredients mixture to the wet ingredients mixture and stir just until moist. Fold in pecans. Let sit 5 minutes to rise and lightly stir again. Let rest 5 more minutes before cooking. Cook the pancakes: Heat a large oiled pan or griddle over medium heat. Use a 1/4 cup measure to scoop out batter and pour slowly over hot griddle to form circles. Let cook for 1 to 2 minutes, until small bubbles start to form on the top, then flip. Cook on the other side for another 1 to 2 minutes. 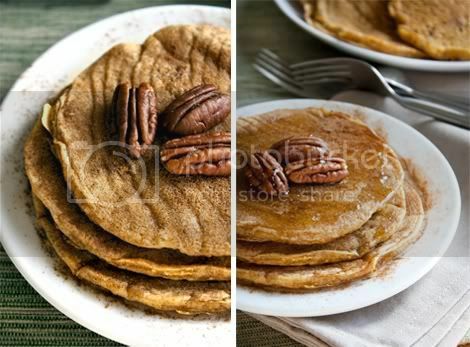 Transfer cooked pancakes to a large plate or serving dish, and repeat until all of the batter has been used. To serve: Stack 3-4 pancakes on a small plate. 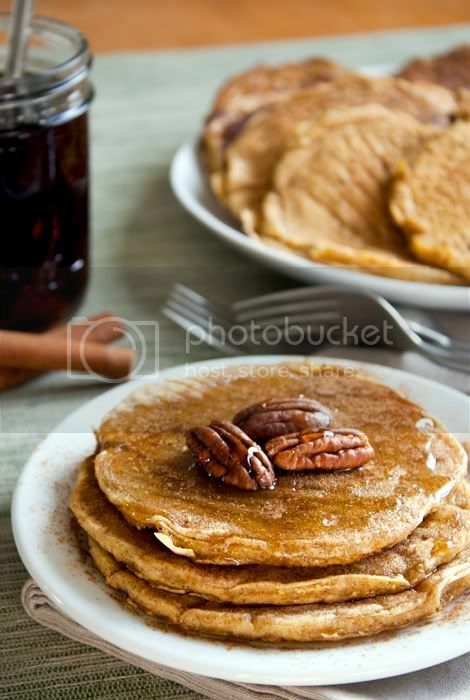 Top with a few whole pecans for garnish, and Cinnamon Maple Syrup. Dust lightly with cinnamon. Serve.